Make an all-purpose window-cleaning solution by combining vinegar, liquid soap or detergent, and water in a spray bottle. Apply the solution to windows the same way a commercial cleaner is used. Combine 1/4 cup of vinegar, 1/2 teaspoon of liquid soap or detergent, and 2 cups of water in a spray bottle. 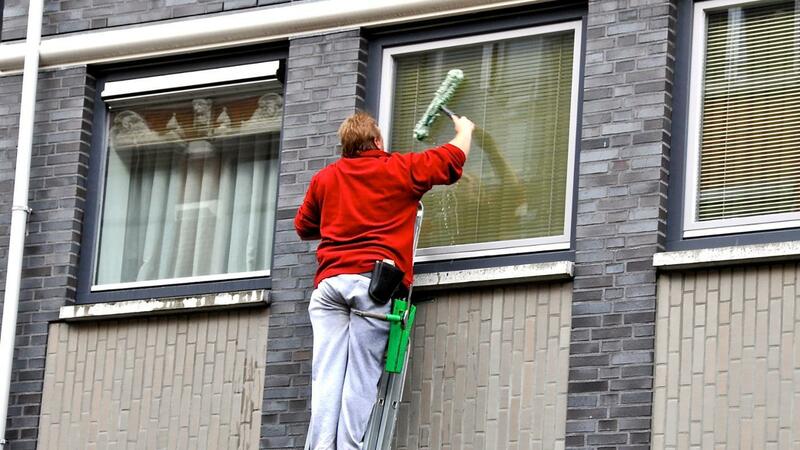 Shake the spray bottle to blend the solution, and then it is ready to be sprayed on windows. Recipes for nontoxic cleaning agents appeared en masse around Earth Day of 1990. Many newspapers listed the instructions for creating such solutions, with the ingredients only being that of plain vinegar and water. To dry the solution, using old newspapers was also recommended. Initially, thousands of people swore off using homemade cleaning solution recipes because the formula left streaks on their windows. The reason for this, however, was that the commercial products they had used for so many years had left a heavy buildup of wax on the windows, and vinegar by itself isn't strong enough to remove the residue completely. The addition of dish soap or detergent combats the wax problem caused by commercial cleaners. Adding just a dab of it to the water and vinegar is enough to help it effectively remove the buildup. How Can I Make an All Natural Window Cleaner at Home? How Can I Make a Window Cleaner With Cornstarch? What Is the Best Way to Polish Aluminum? How Do You Make a Cleaner With Vinegar and Baking Soda? How Do You Make Anti-Fog Solution?